It’s often assumed by newcomers to the business world that to stand an expo is to inherently do your business a favour and rope in more customers. 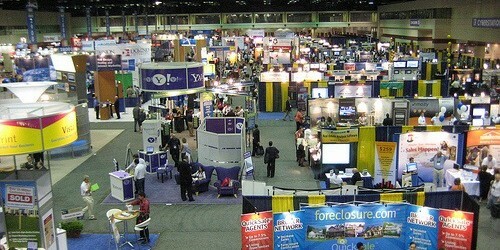 Unfortunately, the reality of things isn’t quite as ideal as this as what’s crucial to remember is that when it comes to competition, there’s no fiercer setting than a trade show. You’re literally placed side by side with dozens of rival businesses with nothing on their minds but outshining you, as those you’re reaching out to evaluate and judge you in accordance with the others in attendance. Suffice to say, it’s a pretty cut-throat experience from start to finish and one that could very well eat you alive if you don’t have the appropriate approach. According to the experts at www.display-boards-uk.co.uk, it’s surprisingly common for trade show newbies to order up a bunch of marketing materials, turn up on the day and ultimately go on to question why the punters didn’t flock their way en-masses. Well, the simple truth of the matter is that it could come down to a thousand and one different factors, but if you have quality boards and banners in place, chances are it’s not your stand that’s the problem, it’s your approach. Which leads to the all-important question – what kinds of tips and tricks should a trade show newcomer follow to stand the best chances of a successful day? Well, first of all one of the most effective approaches of all is to introduce an element of interactivity into the affair. There are dozens of ways you can do this, but one of the most effective has always been that of preparing some kind of competition or contest. It doesn’t have to be for anything extravagant and nor do the details have to be complex, simply offer some kind of prize you know the punters will be interested in and chances are they’ll be begging to leave their names, email addresses or business cards – all of which are pure gold. It might sound like a bit of a cheeky tactic, but it’s a tactic pretty much every big brand in the history of the world has done day in and day out across the board. The simple fact of the matter is that nobody can resist a freebie…assuming of course it’s a freebie that’s of some use or value. In the case of the expo, it’s important to think about who it is that’s going to be in attendance and what they might like by way of freebies. May it age and niche appropriate and chances are they’ll be swarming your way. This falls into the same category as freebies, though in a slightly different way. At some point during the expo, every last person is going to find themselves craving a coffee and begging for a biscuit. As such, if you make sure you’re one of the stands that offer a few of these bits and pieces free of charge, you’re guaranteed a steady stream of guests. Sure, a lot of them will be only in it for the freebies, but you never know just who you’ll snare along the way. Never forget that there’s really no rule set in stone that says you have to sit idly by and wait for the punters to head your way – this tends to be a recipe for disappointment. Instead, it can work so much more in the favour of your brand an business to get a little proactive with the whole thing and actually head out into the crowds to rope in some interest. If you have flyers, coupons or any kind of literature to share, why leave it to gather dust on a table when you could head out and hand it out yourself? It just makes so much more sense and shows the kind of enthusiasm that never fails to inspire confidence. Last but not least, if for one moment anyone heading your way gets the impression your staff would quite literally rather be anywhere else on Earth than at the expo, chances are they’ll pull a swerve and not bother coming back. You need to make your stand a beacon of positive energy for the simple reason that if those in attendance don’t see it as an enjoyable place to dedicate their time to, they simply won’t bother. This is why disgruntled Saturday workers more interested in their iPhones than what’s going on around them will never, ever do your business a favour at any expo.